I vividly remember the first time I ever saw counterfeit merchandise, because it ended with a car accident and an arrest. I was in Manhattan for the weekend in college - I went to college upstate and frequently visited New York - I'm still amazed I didn't get murdered - and I was just wandering around Times Square, window shopping and eating hot dogs from carts. I walked up to a street vendor who was selling purses, and I was shocked by how cheap they were - they were Louis Vuitton, Chanel, etc., but they were all $5-$10. As what was happening started to dawn on me, all of the sudden there was a loud crash, as a taxi smashed into the vendor's serial killer van, which was parked on the curb next to where he was selling these fake purses. I walked past the front of the van to see how bad the damage was, and the taxi had peeled back most of the metal covering the side of the van - from the back bumper to the driver door. Even more astonishing than that was the fact that between the inside of the van and the outside of the van was a bunch of STUFF. The entire side of the van was stuffed with bags of something - probably drugs or cash or God knows what - and it was now exposed. As it started to dawn on me that this was not a good situation for anyone nearby - I saw that the vendor had already thrown all of his purses into the back of the van, and he ran past me to get into the driver's seat - and pealed out to get out of Dodge before the police arrived. It was quite an education in the space of about five minutes. That's all the time you'll get to learn anything in New York. I've always been in the "if it's too good to be true" category, and suspicious of things that are too cheap. When you come across something in a category where everything else is $25, and the thing you're looking at is $5, I can guarantee you that thing is stolen. And a lot of really bad things happened leading up to that stolen property being for sale, so it's best not to be a part of it. Just eat your hot dog and go back to school. Preferably without getting murdered or run over by a taxi. I am doing the tutorial at Splitcoast today! Just in case I haven't said it in a while - we send out a newsletter every week - it has a free tutorial with a video, it has a summary of that week's challenges, hot topics from the forums, and crafty coupons, etc. You should subscribe, which you can do on our home page. So today I have my Gel Impressionism technique featured. This is a fun, two minute process to get impressionistic images with Distress Oxides and your Gel Press. 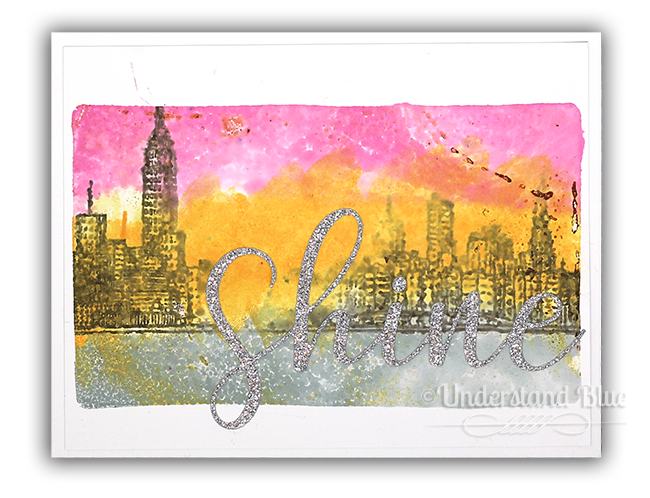 I used my 3x5 Gel Press, as I did in the original video, and for the both samples, I used this gorgeous Sketchy Cities skyline. The sentiment for this card is from the same set, stamped in Nocturne. The image is stamped onto the wet Distress Oxides (misted with alcohol to activate) with Pinecone ink. I had the Gel Press set up in my MISTI and I just printed it as if I were stamping with it onto white cardstock. Because you are using alcohol and not water, plain cardstock is fine for this technique. For the second sample, I used the same skyline - but I didn't press hard enough, so there is a little gap that makes it look like there are two little peninsulas - I just went with it! That beautiful die is this one from Concord & 9th - and yes, that's the glitter paper I've been raving about. I rubbed it on a black shirt and no glitter came off, so I have added it as a permanent fixture in my arsenal. I moved the stamp up a bit on the plate so that the bottom section of ink looked like water. 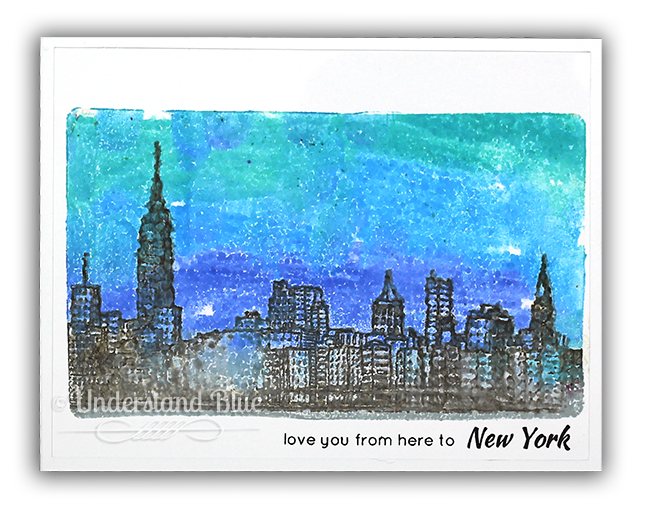 Even if New York isn't within driving distance anymore, at least it's still in my craft room. 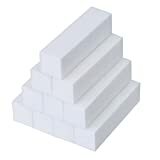 Along with zero counterfeit products, I'm happy to say. And I rarely have to worry about getting run over by one of the yellow ones. Head over to Splitcoast to watch the video and see what we are up to this week! Also - my winner for my Altenew giveaway is Debra Rumpaza - congratulations! I will contact you with instructions! Love how the backgrounds look on your cityscapes. There are no free lunches. If it is legit it is going to cost money. Do with less but only get the real thing. I love the look...I really want to try this out. Thanks for continuing to inspire me...and make me giggle too! !